All the following cutters use the same blade - namely blade #79, order code 79.60 and priced at £43.20/100 blades. They come packaged in 10's. Blade #79 is parallelogram shaped, 110mm long, 18mm wide and 0.5mm thick. There are no snap-off nicks in it, and when fully extended the blade projects with approx 3" (77mm) length of cutting edge exposed on all these models. All these knives can be fitted with snap-off blades (blade #77) but you must then use them with the blade only extended to one segment length. Martor have another range of knives in parallel with this one which use smaller blades which are 95mm long, 9mm wide and 0.4mm thick: please ring us if you need this range or e-mail us. This one is first because it's my favourite cutter for insulation board and expanded foam, as well as many other jobs where shorter blade extensions are needed. Easy blade-change: you just push the red slider assembly out to the right. Order code is 331.00 and price is £5.93 each, packaged on a card. Here's Martor's inexpensive cutter for insulation board and expanded foam. Order code is 46202.08 and price is £2.57 each, packed loose. Here's a second inexpensive cutter for insulation board and expanded foam. Order code is 477.00 (*) and price is £2.27 each, packaged on a card. This one of Martor's knives has a ridged thumb board for extra control and a more grippable shape. Order code is 77177.00 (*) and price is £3.53 each, packaged on a card. 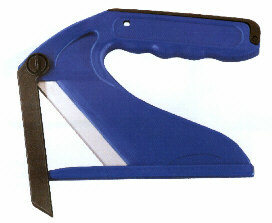 This is another alternative for heavy duty cutting. I don't like it as much as some of the others because its more fiddly to retract the blade. Order code is 67179.00 and price is £7.15 each, packaged on a card. This splendid knife is made of aluminium with plastic inserts and is thereby really strong. An exclusive model, the order code is 107177.00 (*) but you'll have to phone us up for a price because its so new there is no stock or pricing as yet! Knives marked (*) come with a snap-off #77 blade fitted - so you must change it to a #79 blade before using the knife with blade extended for cutting thick materials. If you have a really deep cut to make, Martor can supply extra long blades #779. These are the same width and thickness as blade #79, and fit all the above knives, but are 210mm long. You will appreciate that only the first half of the blade becomes retracted when the knives are 'fully' retracted, leaving over 4" of razor sharp blade exposed. If you must have these, the order code is 779.40 and they cost �85.51/100 blades (packed in 10's). A completely different solution - push the blade through the material. Schaumex will cut up to 60mm thicknesses of board or tubular plastic and, with it's built in blade-guard, is a very safe cutter. The order code is 92687.02 and price is £12.62 each, packaged in a box. With this knife you get 5 spare blades in the handle. The blade for this knife is different to the others: it's #87, is 87mm long x 18mm wide x 0.3mm thick, the order code is 87.60 and the price is 50.76/100 blades (packaged in 10's). All prices mentioned are ex-works, exc VAT and are correct at August 2003. To qualify for the above pricing, you may need to buy boxes of 10 knives.